The next-gen bow of 'Twister' has just encountered some bad weather of its own, with Warner pushing back its planned dual-format January release by a full four months. As we originally reported back in September, Warner had planned a January 8, 2008 Blu-ray and HD DVD bow for 'Twister,' day-and-date with a new two-disc DVD re-issue of the film. Long a favorite DVD demo disc for home theater enthusiasts, 'Twister's next-gen debut was hotly anticipated as the film's CGI-fueled scenes of mass destruction seemed certain to show off the capabilities of both high-def formats. Unfortunately, Warner will be making fans wait a considerable while longer to see 'Twister' in high-def, setting a new street date of May 6, 2008 for all three editions of the film. The studio provided no explantion for the delay, but the release is still labeled as a special edition, so hopes remain high for an extensive package of supplements. We'll certainly keep you posted. Retail for both the Blu-ray and HD DVD remain as announced with a $28.99 MSRP. 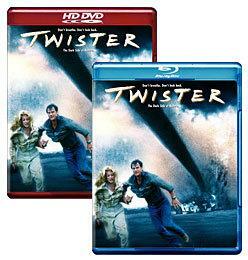 As always, you'll find the latest disc details for 'Twister' linked from our Blu-ray Release Schedule and our HD DVD Release Schedule, where it's indexed under its new date of May 6, 2008. We've also set up dedicated threads for Warner's latest in our Forums area -- click the following links to discuss the 'Twister' Blu-ray release and the 'Twister' HD DVD release.